Reliance Nivesh Lakshya Fund or Reliance NFO, an emerging debt fund, specifically designed to fulfil your long term goals is all set to enhance your financial portfolio. So, let’s dig deeper into it. Long term financial planning is an indispensable part of our life and it should be started at a young age in order to reap its true benefits on your retirement. But, you tend to get confused seeing at the plethora of investing alternatives ranging from traditional options like fixed deposits, PPF, bonds to the trending ones like equity and debt mutual funds, stocks etc. However, amongst various investment plans, mutual fund investment both equity and debt funds have gained a lot of traction recently. If you are a high risk investor, equity funds or stocks might be your choice. But, if you are a moderate/low risk investor, you may be satisfied by investing in long term debt funds only. So, here, we have something for the long term low risk investor, a new mutual fund scheme: Reliance Nivesh Lakshya Fund. Reliance Nivesh Lakshya Fund, a new offering from Reliance Mutual Fund is a pure open ended debt fund. The investments shall be predominantly done in long dated Government securities (G-secs). If you ask for a good long term investment option assuring optimal returns, this might be your answer. Let’s take a sneak peek into the numerous benefits of this long term investment plan that can surely add a great variety to your financial bucket. Reliance New Mutual Fund (Reliance NFO) seems to be a golden opportunity to secure the prevailing interest rate for next 25-30 years. Now, isn’t that amazing! A debt fund where money shall be put into long term fixed income securities that includes G-Secs, commercial paper, treasury bills etc. So, a more secure investment option. A scheme with a long investment horizon to cater to your future financial needs. 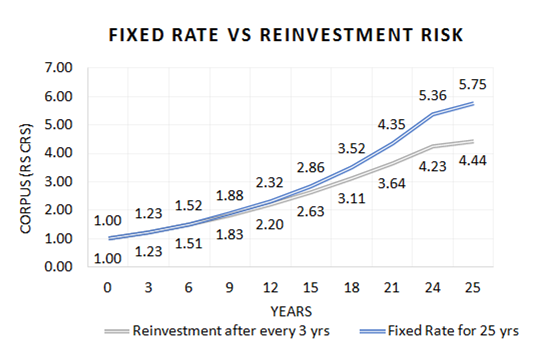 You tend to gain from falling interest rates if you plan to keep hold of this fund till maturity. Reliance debt fund needs a minimum investment of Rs.5000 only. You can start an SIP (Systematic Investment Plan) also. Reliance NFO helps you capture the current high interest rate for a longer term. You can generate good returns without taking too much of risk. No minimum lock-in period, so you can withdraw any time as per your convenience. Flexibility of withdrawal through the Systematic Withdrawal plan (SWP) seems to be the best part! Enjoy the indexation benefit after 3 years, so you get some tax relief as well! Traditional Investments vs Nivesh Lakshya Fund: Which is better? The declining interest rates on fixed deposits is really a matter of concern for potential investors. FD’s are losing their charm and attraction that they used to have few years back. The rising NPA’s further raises questions on the ratings and credibility of different banks. This image itself shows the true picture of how big your corpus grows over the years if you invest in fixed income schemes like Reliance NFO. The risk factor also gets reduced as compared to other asset classes. ALSO READ How Much Money Do You Need For Your Retirement? However, a lot of HNIs still hold a substantial portion of their savings in FDs and other fixed income instruments. Looking at the present scenario, it’s high time to diversify and explore other practical alternatives like Reliance mutual fund schemes. If you are planning for your long term financial objectives, this might be a feasible investing option. May it be your child’s education or marriage or your retirement planning, Reliance NFO takes you a step closer to achieve your target. If you are a low risk or conservative investor and have a very long investment perspective, this might be a good fit for you. If you are HNI (High Net worth Individual) Reliance NFO might help preserve and grow your wealth without making you subject to undue risk. For parents/grandparents, you have a wonderful opportunity to create a beautiful legacy for your child or grandchild. For all others, this Reliance new mutual fund scheme prepares you for your long term income generation needs. Having some reliable debt funds in your investment portfolio and a disciplined investing approach can help you grow your money. It’s your hard earned money! You don’t have to compromise while investing it in different investment plans. What are you waiting for? Make your dreams come true! Secure a well-invested future, lock the prevailing interest rate and be ready to get better returns in the long run through these emerging new mutual fund schemes. 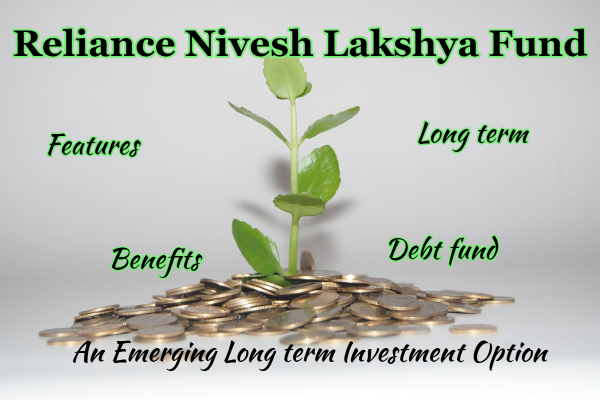 https://fintrakk.com/reliance-nivesh-lakshya-fund-nfo-long-term-investment-option/Reliance Nivesh Lakshya Fund: An Emerging Long Term Investment Optionhttps://fintrakk.com/wp-content/uploads/2018/06/Reliance-fund-1024x683.pnghttps://fintrakk.com/wp-content/uploads/2018/06/Reliance-fund-150x150.png 2018-06-29T13:53:17+00:00 adminInvestmentlong term investment,Nivesh Lakshya,Reliance new mutual fund,Reliance NFO,Reliance Nivesh Lakshya FundReliance Nivesh Lakshya Fund or Reliance NFO, an emerging debt fund, specifically designed to fulfil your long term goals is all set to enhance your financial portfolio. So, let’s dig deeper into it. What will be the interest rate yearly? How much I would expect after 25 years if I invest 1 lakh on my daughters very first birthday? (She is just 6 months old now).